Artificial intelligence is no longer a shiny new thing. It’s been here for a while. If you’ve done a Google Search or clicked on a recommended product, article or film, you’ve interacted with it. If you’re a marketer, you’ve probably already worked with it. Advertising on Google Ads, Bing, or Facebook is working with AI. So stop bracing yourself against “the rise of the machines.” The machines are here, and they’re really quite obedient. They’re great at automating some of marketing’s most boring tasks. The question is, where is all this automation going? How many tasks will machines take over? What will your job be like as they evolve? And how can you position yourself and your company to make the most of it? The answer is simpler than you’d think. But it is a four-part answer. Pop quiz: What’s the difference between machine learning and artificial intelligence? Most marketers can’t rattle off an answer to that. 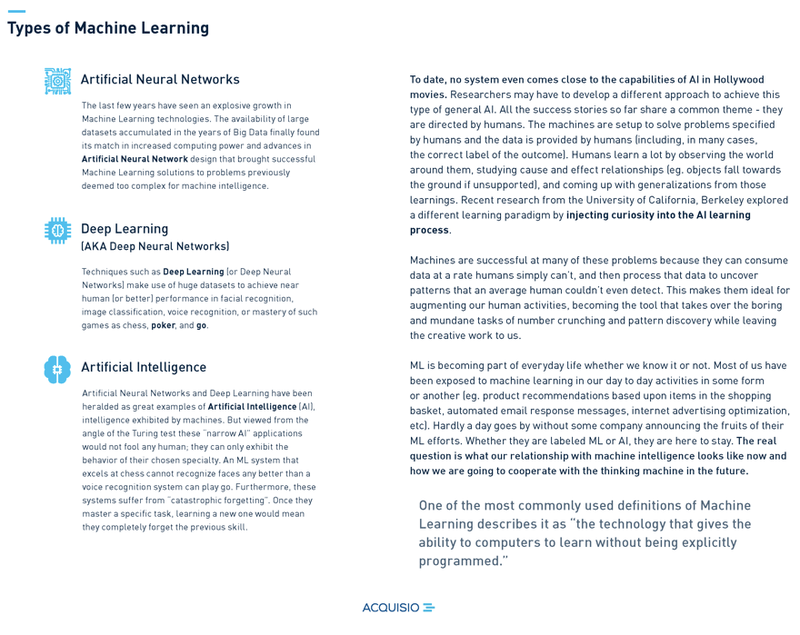 We probably know that an AI is more sophisticated than machine learning, and that machine learning is a subset of AI…. but things get murky from there. AI is any technology that enables a system to demonstrate human-like intelligence… Machine Learning is one type of AI that uses mathematical models trained on data to make decisions. As more data becomes available, ML models can make better decisions. 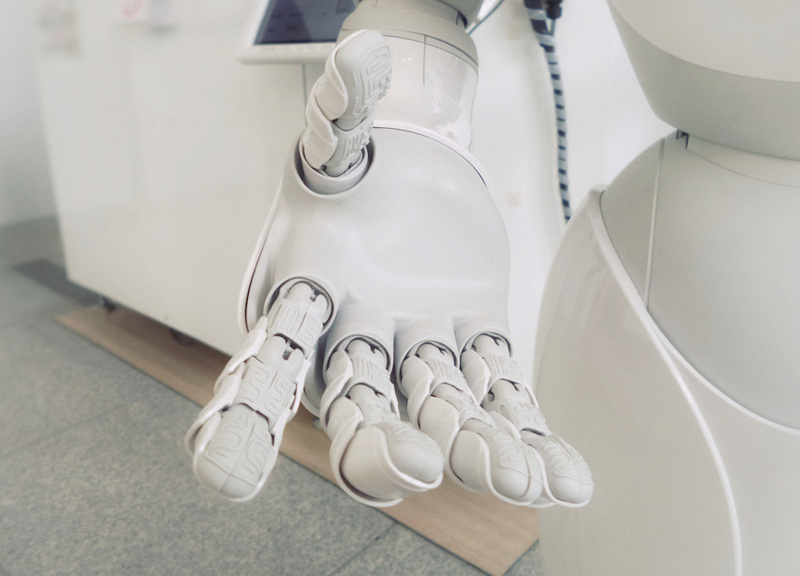 Honestly, for real-world marketing applications – stuff you’ll see on the job in the next three years – marketers probably don’t have to worry too much about true artificial intelligence right now. Google Ads isn’t going to start telling jokes. But machine learning is definitely in play, as is automation. This is a good thing. Managed well, machine learning can make you far more efficient and effective. For instance, our PPC bid and budget management tool uses full-fledged machine learning to manage bids and budgets. Simple automated bidding consists of letting a computer follow a set of rules that will, in reaction to certain triggers, increase or decrease PPC bids by certain amounts. This type of automation doesn’t learn, it simply executes according to pre-set rules. This level of automated bidding is not so different from a marketing automation system that’s set to send a particular email out at a particular time after someone has downloaded a particular white paper. It’s a pre-defined action a marketer can set, and then expect the software to execute every time that event happens. Machine learning is much more sophisticated. “While simple automated bidding requires that a human first establish a target CPA, a machine learning system aims to get the lowest CPA possible for the highest number of clicks and conversions.“ This requires the machine learning system to manage dozens of different priorities and data inputs (“microservices,” as we call them) to deliver the desired result. That’s a whole other order of magnitude. And if we’re going to rebuild our marketing for the AI era, we need to understand how these systems work and differ in detail. For a surprisingly clear explanation of how machine learning systems are built, watch Google’s video series, “AI Adventures”. The videos get more technical as you progress through the series, but the first ones are very accessible. Here’s a sampler. In this video, you’ll see how a machine learning program might be designed and trained to distinguish between beer and wine. 2. Clean Up Your Data. Automation, machine learning and AI all run on data. And so the saying “garbage in, garbage out” will be even more meaningful in the coming years. As you know, data management is a huge issue in marketing. Often, we have legacy systems that generate data that won’t “talk” to data from other systems. Or we have data that is unstructured, and thus can’t be processed by a machine learning program. Google’s definition of machine learning is “using data to answer questions”. This is an excellent, clear explanation, and if you’re already thinking about data quality and organization, it gives you a big clue about how organized and accurate your data will have to be before anybody can ask questions of it. After all… how many duplicates do you think are in your prospect database? Do you have every image you’ve ever used in marketing in a content vault, organized by file format, subject, multiple tags, creators, and where that image has even been used? That’s organized data. And it’s a critical part of future-proofing your company so you can do fancy magic with AI later on – or with machine learning and automation this year. Machines are great. They do exactly what you tell them to do. And nothing else. This can be very humbling. I studied Perl (a coding language) about twenty years ago and immediately realized that if anything went wrong, it wasn’t the code or the hardware’s fault. It was mine. If I didn’t use the right operator, or just missed a comma somewhere, the machine would dutifully and perfectly execute according to my directions…which would not match what I actually wanted it to do. Most of us won’t have to code directly (a huge thank you to all the apps that let us basically code through their friendly WYSIWYG interfaces). But we do have to get our instructions right. So if you’ve defined a marketing qualified lead to your machine learning application in a particular way, it’s going to find people based on exactly those instructions. If your instructions are flawed, your results will be flawed. Don’t blame the application. This is critical to understand if you want to set up automated systems with data. The data has to be accurate and readable. And then the instructions you give the machine to do its work have to be correct. There’s another level to this, too: we have to be able to quantify our goals. So when we say “I want to improve the customer experience,” that’s great… but how can you quantify that for a computer? You’re going to need some very specific measurements and very specific inputs to track those measurements before the computer can begin to improve customer experience. Computers are mind-bogglingly granular; they can’t make the inferences and conclusions that humans make so effortlessly. That’s why we get to keep our jobs, but it’s also the intimidating work of programmers – to break down lofty goals into programmatic nuts and bolts. 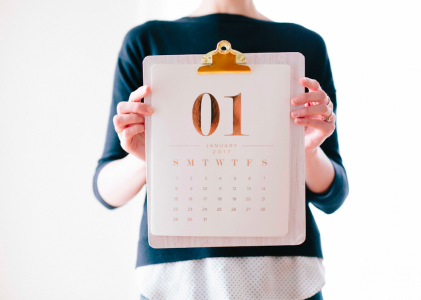 If you want to future-proof your marketing, you’ll need to get all those nuts and bolts – those goals and definitions – dialed in first. 4. Optimize for Voice Search. Hopefully we’ve been concrete enough in our suggestions so far. But if not, here’s a very clear directive: start optimizing for voice search. This is one aspect of AI that is definitely already here. As Cady Condyles mentioned in “AI is Smarter Than You: Adapting your Retail Strategy to Keep Up”, (her keynote presentation at Hero Conf London) by 2020, 30% of web browsing will be screenless – done via digital voice assistants. Voice recognition is one of the most meaningful developments of AI so far. Search is another key AI achievement. So if you want to position your brand and your marketing for AI, there’s one very specific place to focus your efforts: voice search. Optimizing for voice search is actually just an example of an earlier point discussed here: clean up your data. Make it accessible to the machines. Optimizing a website for voice search is exactly that: taking a mishmash of data (our websites) and distilling it into something a machine learning or AI application can parse. Another one of Cady’s recommendations, to “use intent-based AI to identify and reach your shoppers” is an example of this principle in reverse. If you use intent-based AI to communicate with humans, you’ll need to plug into a system that has processed petabytes of data from human browsers and distilled it into a machine learning application. Here again, raw data has been synthesized into an application that can recognize patterns and recommend actions. There’s going to be more and more of this taking huge data sets and finding patterns and trends in them. And that’s good – machine learning and AI need lots of data to work. They need predictable environments and consistent tasks to really shine. Which is exactly why human marketers aren’t going anywhere. We humans can function quite well with limited data. We can be quick to adapt to new situations, and we’re great at making big cognitive leaps. The machines aren’t there yet. Pam Neely has been in digital marketing for 20 years. She's a serial entrepreneur and content marketing enthusiast with a background in publishing and journalism, including a New York Press Award and a Hermes Creative Award for blogging. She has a Master's Degree in Direct and Interactive Marketing from New York University. Follow her on Twitter @pamellaneely.